Save Money by Living in Hotels? I enjoy the benefits of living in hotels full-time, while also saving money! I especially love the stress-free lifestyle and the abundance of free time in my life. Update: In October 2018, I created an updated version of this comparison. See Save Money By Living in Hotels: 2018 Edition. The hotel lifestyle may not be appropriate for those who have a big family, certain pets, or certain hobbies. It may not make sense for those who already invested in a house, furniture, etc. and are satisfied with their lives. It may also not be suitable if you don’t get along with your partner well because you will be spending a lot more time and space with him or her! The hotel lifestyle may work well for those just starting to live on their own or as a couple. It could also be appropriate if you are tired of the clutter, the bills, the chores, the errands, and the risks associated with owning a house and a car. The hotel lifestyle may be ideal if you are tired of having a never-ending to-do list, and you want to reclaim your time away from work. It can be extra lucrative if you travel for work; if your job is paying for your hotel and meals, you’re living completely for free! 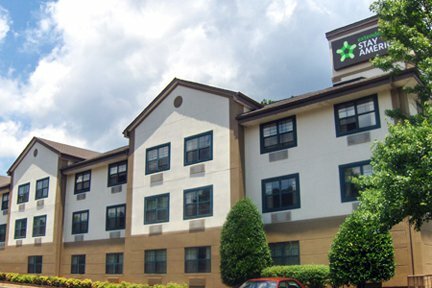 The current room rate at Extended Stay America in Marietta, Georgia is $39.59/night. Benefits differ based on the class of hotel. For example, a budget hotel will likely not include any breakfast. A standard hotel may include some pastries and apples. A premium hotel may include a full breakfast buffet. A luxury hotel may include a hot made-to-order breakfast of your choice. When booking standard, premium, or luxury hotels online, use a Corporate or Government code, if possible. Most major corporations have a partnership with the major hotel chains, and the rates can be significantly lower than what the pubic sees. Veterans and seniors can also get good discounts. Look for specials and book in advance. The more advance notice you can give, the better the rates. Advance notice will also help ensure you’ll get an upgraded room once you become an elite level. Maintain a good relationship with hotel management. After establishing yourself as a good hotel guest for a few days or weeks, request a lower long-term rate. So far, this has worked for me every time! In the United States, hotel patrons must pay sales tax during the first 30 days of their stay. After staying for 30 days, Americans are considered residents of the hotel and no longer have to pay the hotel taxes. In some cases, I have also had the first 30 days’ tax payment reimbursed to me. Again, it’s worth establishing a good relationship with hotel management so you can work as a team. Let’s do a quick comparison between the hotel lifestyle and owning a home, using 2 scenarios: Budget and Premium. Estimates do not include one-time costs associated with setting up and furnishing the house. Down payments and any gains or losses associated with the sale of the home are also not included. Monthly Hotel Living Expenses: $39/night * 30.5 nights = $1200. Monthly Expenses of Owning a Home: $900 + 500 = $1400. Summary: Depending on your specific expenses, you could save money by living the hotel lifestyle. Flexibility – With a starter home, you are investing in one particular location, price point, and home. If your job or family situation changes, or you have problems with your home, it may feel stuck. The hotel lifestyle enables more freedom and flexibility. Minimal stress – You eliminate the chores / errands / shopping / maintenance from your life. You can use your precious time for enjoying life, volunteering your time for a good cause, attending school, a second job, etc. Unclean hotel – The cleanliness standards in some budget hotels may not meet your standards. This can be mitigated by talking with management or changing hotels. No refrigerator – Budget hotels may not include a refrigerator. The inability to store some of your groceries may impact your ability to eat economically. Owning a home includes owning a car. A car note and related expenses, e.g., insurance, inspections, gas, maintenance, tickets/fines, $600/month. Premium hotel living includes free local shuttle transportation. However, a budget of $300/month is used for taxis as needed. Owning a house may also have additional expenses for housekeeping, lawn service, pest service, pool service, gym membership, etc. Let’s assume $300/month for additional expenses like that. Estimates do not include one-time costs associated with setting up and furnishing the house. Any gains or losses associated with the price of the home when sold are also not included. Monthly Expenses of Owning a House and Car: $1500 + $700 + $600 + $300 = $3,100. Summary: Total expenses are similar. However, reality is that owning a house usually means extra shopping and services, which means more $$$ every month. E.g., you want to own the latest surround-sound TV and Blu-ray movies, the guest bedroom needs a new futon, the roof needs replacing, and the A/C needs repair. All 10 of the benefits I mentioned in Top 10 Benefits of Living the Hotel Lifestyle! Living in a premium hotel (as opposed to a budget or standard hotel) offers additional levels of safety, security, service, and quality. Premium hotel reward programs can also provide more benefits, such as upgrades to suites and more free nights. No permanent address. However, given how simplified your life is now, why do you need one? I usually just keep my employer updated with my current hotel address. For long-term things, I use a family member’s address. Feeling crowded. If you’re used to having lots of space and stuff, you may feel uncomfortable giving it up at first. Fortunately, frequent stays in premium hotels at least will get you upgraded to a suite for free. Being away from family and friends. Like anything, this could be seen as a pro or a con. Personally, I greatly enjoy having friends all over the world, even if I don’t see them in person often; Facebook helps with that. I generated these estimates in this Hotel Life spreadsheet (Excel), which compares expenses between hotel living, owning a house, and renting an apartment. Feel free to download it and enter your own costs to see if hotel living may save you money. It is just amazing how many little costs drop away when you are living in a hotel. We are currently traveling for the summer between the end of one apartment lease and the start of the next. Fortunate timing on the new apartment we want and a chance to experiment with hotel living. So I’ve been reading your posts while settled into our TownePlace Suite complete with kitchen, so extra fun. Home owners can be a sensitive lot and it has gotten me a fair amount of hate. But lots of love too. My guess is yours will be the same. Thanks for sharing your blog post. I laughed a lot, and I definitely agree with your points. It took me many years and lessons to wake up to the fact that buying a house is indeed a terrible investment! I hope people don’t get offended by my blog post, but you’re right, some hatred is probably inevitable. Well written. Very balanced. Seriously funny. So fascinating. Just found this post and haven’t searched through your others, so apologies if this has been answered but what are your total costs per month of living this lifestyle..
Ie hotel, food, transport, insurance, whatever your total costs..curious to see that number. Also no worries if you’d rather not disclose that.. I am currently enjoying a “Premium” hotel in the $89/night category. My average monthly expenses are $2700 for the hotel +$100 for tips and incidentals + $200 for taxis and entertainment + $400 for lunch and dinner + $100 for dry cleaning & laundry service. That’s a total of approx. $3500/month. Of course, a person’s total monthly costs in the “Budget” and “Standard” scenarios would be less than that. If anyone downloads my spreadsheet and enters some real-life numbers to do a comparison in either of those categories, it would be interesting to see the results. Great research and information. I love my home. Your blog doesn’t offend me. Everyone is entitled to live their own life. To each his own and enjoy!!! Great job. Very interesting to do the math behind it and see that this could be a viable option in the future. I’ve always associated long term hotel stays with the lower quality options out there, but you seem to have made it work in your favor and at very nice places as well. Thanks for the spreadsheet and keep the posts coming. Hi Libby, I’m late to the party but wanted to ask: Which sites do you recommend to find and price long-term hotel rooms? Hi David. Unfortunately, I have not found any site or app helpful other than directly with the hotel chains. As a top tier member in both Hilton and IHG hotels, I often visit Hilton.com and IHG.com. I do this for 3 reasons: 1. Most of the time I am only interested in refundable rates. 2. I use corporate codes to get the best rates. 3. The big hotel chains will only give you points if you book direct with them. Points add up and turn into free nights and/or upgraded rooms. Libby, thank you for the spreadsheet. It’s great to see the comparison for those who own and those who rent a home. Thanks for your comment, David. I’m glad the spreadsheet was helpful to you! Do you have periodic updates to you hotel-living experience? Hi David. I am just coming back from a 2-month break, and I will definitely be blogging more about my hotel living experience. Please check back in a week or so, or follow my blog. Also, if you have any particular questions or topics you’re curious about, please let me know. Thanks! Hello Libby. I have been reading, researching, following, etc the RV Lifestyle blogs. After a couple of years’ research, visiting with both owners and dealers, I came across your blog with its focus on living in hotels. This has given me a new avenue of thought. So, I am following to see how you update it, your experiences, etc. Hi David, I hope you find my recent posts helpful – sorry it took so long! Following is an updated version of my actual costs and a comparison. Let me know if you have additional questions for me.